Zelda throwing a Power Suit Piece. Power Suit Pieces are the pieces of Samus' armor that fall after she depletes her Power Suit to fight in her Zero Suit in Super Smash Bros. Brawl. Any player can then pick up and throw the three pieces of her Power Suit. Each piece, when thrown, deals much knockback and moderate damage. To shed her Power suit and play as Zero Suit Samus during gameplay, one must use Samus' Final Smash, the Zero Laser, and she will shed her Power Suit promptly after the blast, or rapidly alternate pressing the input for her up and down taunts. One can start as Zero Suit Samus in a match by holding the shield button while advancing from the character select screen. When one does this, Samus' on-screen appearance is replaced with her suit dismantle animation, which will also produce Power Suit Pieces. 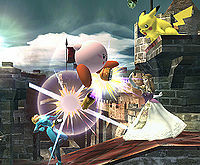 The Power Suit Pieces are considered to be useful projectiles in competitive play, and players will usually try to keep one on the screen for repeated use. The pieces can be thrown rather far, which is further supported by Zero Suit Samus's quick glide toss, that also covers a moderately large distance. The pieces also have decent knockback (very high for a projectile - they even have some KO power against offstage opponents). Glide tossing a piece while throwing it up is considered a solid approach option that covers Zero Suit Samus while she can short hop and space with a forward or back aerial. However, there are ways to deal with the pieces, such as Falco's Reflector. Characters with quick air dodges such as Meta Knight can also grab them relatively easily if they see it coming, and if the opponent has access to a glide toss that covers large distance (most notably Meta Knight, Sonic, and Pit), they can use it to their advantage as well. In Super Smash Bros. 4, Power Suit Pieces are no longer items. This comes with the fact that Samus and Zero Suit Samus are now separated characters, so Samus' Power Suit will no longer break into pieces after using her Final Smash, and additionally, Zero Suit Samus' on-screen appearance no longer involves her shedding her Power Suit. When fighting against Samus in Classic Mode, the dropped Power Suit Pieces will appear larger than usual, but return to their regular size when picked up. The three power suit pieces all come from her right arm (shoulder, forearm, and Arm Cannon). This page was last edited on December 17, 2018, at 21:59.